Mont Granier is positioned fairly and squarely at the northern end of the Chartreuse Massif, and is justifiably renown for its massive northern face which can be seen to spectacular effect from the road at the col du Granier, as well as from the town of Chambéry. It is also, however, a magnificent mountain in its own right which reserves its main attractions for those with the energy to explore it on foot. To the north (map), the mountain is totally protected by a huge rampart, which is the result of a catastrophic collapse in 1248 when a sizable chunk of the mountain fell away resulting in a devastating avalanche which killed over a thousand people. The southern edge of the mountain is delimited by the pastures of l'Alpette, from which it is separated by further cliffs which mark the line of a prominent geological strike-slip fault that cuts through the massif. The Pas des Barres is a route which allows access from l'Alpette through a weakness in the north-eastern end of this cliff. The western side, overlooking the Vallée des Entremonts, is also girdled by massive cliffs, but with two weaknesses which allow access to the crest. 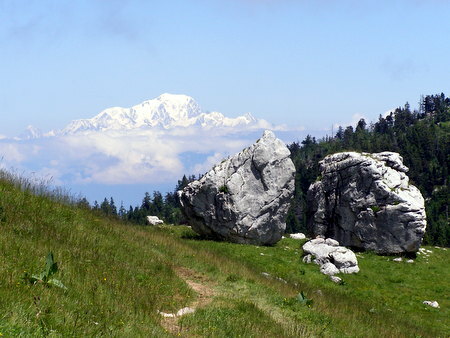 As with the other massifs in the Hauts Chartreuse, the mountain is honeycombed by caves with over 90 km of passages having been mapped under a surface of less than 3 km², of which over 55 km are interconnected. Until recently it was possible for walkers to explore one section of cave from Cuvée des Ours to Grotte Arva, a window high up in the northern cliff face, but the major landslip of 2016 covered the entrance and the route is no longer accessible. The starting point for three of the walks is la Plagne. This beautiful little hamlet nestles in a sea of open pastures in the impressive cirque bounded by the southern summit of mont Granier to the north and the summit of Le Pinet to the south. Parking may be found on the right at the start of the prominent zig zag leading to the hamlet, as well as just up from the forestry track leading from the apex of the zig zag. The fourth walk, starting from Bellecombe, makes use of the two main passes into the massif from the east.